A Big Ol' Bean Battle Erupts Between Chi-Town And H-Town Chicago and Houston are fighting over something very big or something very small — two beans. But there's a plot twist. Visitors look over the Cloud Gate sculpture, also known as "The Bean," in Millennium Park in Chicago. The Windy City and the Bayou City are fighting. Depending on your perspective, it's over something very big or something very small — two beans. Though Chicago and Houston have been longtime rivals, Houston's installment of an enormous silver art piece on Monday got people in both cities all fired up. Just wait for the plot twist. 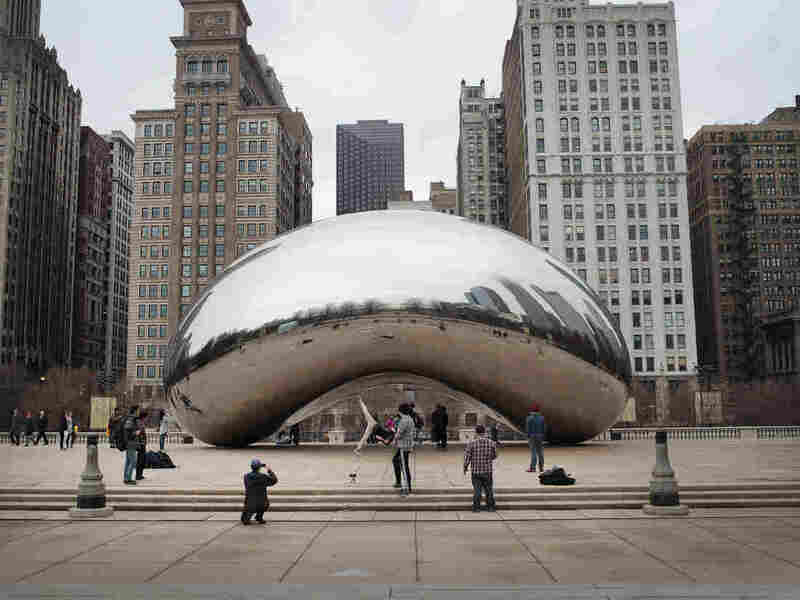 Chi-town lovers say their problem is that the Houston Anish Kapoor sculpture, lowered by a crane and installed outside the city's new Glassell School of Art building, is just too similar to the "Bean" in Chicago's Millennium Park. Their bean. Chicago's Cloud Gate, by the same artist, has become an iconic tourist destination — one of those places that make selfie enthusiasts' dreams come true. On the other side, Houstonians argue that even if their new piece — which looks more like a vertical liquid vitamin — is similar to the Chicago kidney-bean-shape icon that lies on its side, Houston is just a better city anyway. The fight has escalated, as most high-profile fights do these days, on social media, with residents in both cities tweeting daggers at each other. Some of the sharpest insults are coming from the editorial pages of the cities' papers. Columnist Kim Janssen with the Chicago Tribune wrote Tuesday about Houston's new feature in a piece headlined "Unoriginal 4th place Houston gets its own bean sculpture ... whatever." Houston is the fourth-largest U.S. city. It trails behind No. 3 Chicago by just over 400,000 as of 2016, according to the most recent data from the U.S. Census Bureau. Janssen commented on his rival city's recent growth, acknowledging that Chicago could potentially lose its place as the country's third-largest city. But he chalked that up to people's bad decisions to move to or even visit the Texas city. He wrote that Houston's shiny new tilted bean would only serve as a constant reminder of that. "If being surrounded by a cultureless abyss insufficiently communicates to confused tourists that they are in Houston," he said, "the bean's verticality will therefore act as an additional reminder of their poor life choices." It was the "cultureless abyss" comment that inspired Lisa Gray, senior editor at the Houston Chronicle, to respond. She entered the fray by reaching out to Janssen, asking at one point, "Is Chicago feeling defensive?" The paper published the string of responses that followed. Who can resist a juicy email war? Janssen and Gray spat back and forth in journalism's version of a rap battle. "The idea that a giant Texas suburb masquerading as a city may soon supplant us is galling," he said, responding to Gray. "But your bean ... your bean is wack." The two called out each city's weather, sports teams, culture — you name it. They're the type of emails historians will psychoanalyze and think, "Oh, that's how we got here." At the base of everything were those darned beans. Now here's the plot twist in this tale of two cities. The thing about all this is that both pieces were created by the same British artist, Anish Kapoor. While Chicago's Cloud Gate was made in the U.S. and is larger than the one in Houston, Houston's Cloud Column is actually the original bean. It was made almost 20 years ago, according to the Houston Chronicle. David Williams, the fabricator who has worked with the artist for over 30 years, told the Chronicle that Houston's bean was made in London over a period of five years and polished for three more. Janssen didn't concede the Houston bean's superiority on this point. In fact, he just dug in more. "It's a leftover bean, a second-rate bean that's been lying around in storage for the better part of 20 years, because nobody else wanted it," he wrote to Gray. "Nobody except Houston wants a leftover, second-rate bean." In the end, it may just be a matter of where you've bean and where you're going. Houston's Cloud Column will open on May 20 when the rest of the plaza opens to the public. In any case, Chicago will have something else to worry about this weekend.